After Test Cricket, One-Day Cricket and T-20 Cricket, there is a new format of Cricket born in India – it is ‘Idea Oongli Cricket’! With the new campaign this summer, Idea Cellular will bring Cricket at fingertips for the experts of the game as well as novice, men & women, old and the young, and everybody else who uses a mobile phone. The new teaser campaigns already running on Television have been urging people to keep their fingers in good shape as ‘Idea Oongli Cricket’ is coming. The new format of the Game will allow millions of mobile users in India to participate in this unique campaign. Idea Brand Ambassador Abhishek Bachchan along with other celebrities and cricketers will appear on TV, in this campaign. Viewers will be asked a question based on the events and happenings of the ongoing match of the day. The campaign has been designed to enable everybody to participate as it does not require detailed knowledge of the game. Each question will be unique and promises to be fun. Viewers just need to exercise their fingers to SMS the right answer after the question is asked. 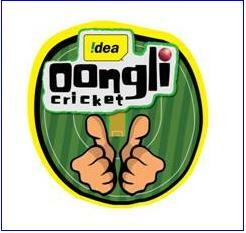 ‘Idea Oongli Cricket’ can be played by all mobile phone users by SMSing their answer to ‘9594939291’. The number is toll free for Idea subscribers, and standard messaging rates apply for other mobile subscribers. All Idea customers who send in the correct answer will get Idea VAS Packs for three days. Talking about the new campaign Mr. Pradeep Shrivastava , Chief Marketing Officer, Idea Cellular said, “All Indians are connected with Cricket, in some way or the other. However, only a few get a chance to play the sport while millions just remain spectators of the match. ‘Idea Oongli Cricket’ will enable every Indian to participate in this match of cricketing intelligence. Like all Idea campaigns, the concept is fun and entertaining, and will engage a cross section of consumers through the power of telephony”.